When a major consumer financial services provider embarked on an ambitious messaging program, the quickly realized that SparkPost’s email infrastructure was the clear choice. But as a business entrusted with consumers’ most sensitive financial data, the bank needed to ensure that their technology provider did not make compromises that might jeopardize the business’ well-earned trust. Their service provider’s technology platform incorporated all practical security features and was hardened to external threats. The partner followed industry best practices for operational control of its processes and systems. With these iron-clad imperatives defined, the bank met with SparkPost’s engineering, operations, professional services, product management, and executive teams to carefully examine SparkPost’s technology implementation and business operations. 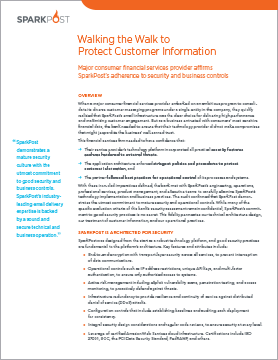 When this financial services provider examined SparkPost’s security practices, it confirmed what we already knew: SparkPost demonstrates a mature security culture with the utmost commitment to good security and business controls. The bank’s audit gave the company confidence that SparkPost’s industry-leading email delivery expertise is backed by a sound and secure technical and business operation that underlies every aspect of our technical architecture design, our treatment of customer data, and our operational practices.